This forum is pure hardball. Bring the heat in this discussion of Flames baseball. - October 25th, 2018, 8:59 am #561676 Should be dropped soon. Ive seen home and away with vt and road 3 game series against south carolina early. - October 25th, 2018, 2:53 pm #561698 Good to see baseball schedule, even if it is just bits and pieces. - October 25th, 2018, 3:19 pm #561705 The power of FlameFans lives even beyond the name change! - October 25th, 2018, 3:46 pm #561706 Hopefully softball schedule isn't far behind. - October 25th, 2018, 6:28 pm #561717 Whoa. - October 25th, 2018, 6:40 pm #561718 We better be ready to play. Thats the most difficult schedule ive seen us play. Tougher conference, 10 home and home acc games, 4 road sec games. Usf and delaware could be decent as well. - October 25th, 2018, 8:33 pm #561725 I be in Columbia if LU softball is playing. I doubt I make trip for baseball. Could the fan base ask for more? That's magnificent. Bruce Coslet wrote: We can’t run. We can’t pass. We can’t stop the run. We can’t stop the pass. We can’t kick. Other than that, we’re just not a very good football team right now. - October 26th, 2018, 8:42 am #561752 Magnificent.......... Maybe. Or you could describe it with another word that begins with M.
oldflame wrote: Magnificent.......... Maybe. Or you could describe it with another word that begins with M.
Ummm..you definitely went left on that one lol. Schedule looks nice and it will be tough for sure. Hope those boys are preparing well for this season. 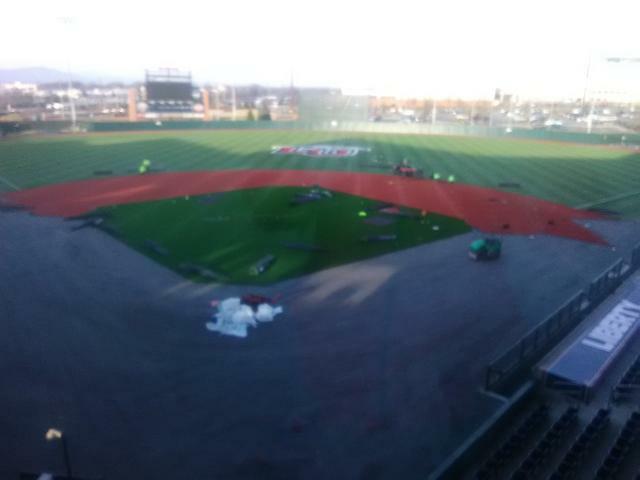 - December 19th, 2018, 10:18 pm #567650 New AstroTurf infield installed in stadium. - December 20th, 2018, 12:24 pm #567698 I took a photo of that yesterday, I would post it on here, but have no idea how. - December 20th, 2018, 3:44 pm #567716 Go to imgur.com and register a free account. Upload the pic and then click on the upoaded pic and it will give you a direct link. Post that on here and I will fix it for you. - December 20th, 2018, 4:11 pm #567718 I registered, but now it wants me to buy an App to upload photos. I not going to buy it. ballcoach15 wrote: I registered, but now it wants me to buy an App to upload photos. I not going to buy it. The app is free, but you can upload pictures on the website. I've never paid for imgur. - December 20th, 2018, 4:18 pm #567721 I found a way to do it on a computer, but photo is on my phone, and I cannot find way to upload it with phone. - December 20th, 2018, 4:52 pm #567722 Email the pic to yourself and download it from your email. - December 20th, 2018, 5:01 pm #567723 I tried that and the stupid phone wanted me to create an email address when I already have one. I finally emailed it to me. I saved it to My Drive, then I could not find my drive. I give up. - December 20th, 2018, 5:53 pm #567730 Email it to me and I will post it for you. - December 21st, 2018, 8:43 am #567782 So is that a replacement of the same type of surface or is this a different surface than the rest of the field now? - December 21st, 2018, 9:34 am #567795 It looks different, but maybe outfield turf is faded. I did notice on the rolls of turf in parking lot, the label said Astro Turf. - December 21st, 2018, 11:58 am #567819 Did you see a Hellas vehicle there? I have connections.